Concentric AB, formerly part of Haldex, will feature a range of low-noise, high power density hydraulics products at booth 80908 located in South Hall 3 at IFPE CONEXPO-CON/AGG 2014 in Las Vegas from 4 to 8 March. Concentric Hydraulics was formerly known as Haldex Hydraulics and before that as John S. Barnes, a name still widely known in US and international markets. The company's prduct range includes hydraulic motors, pumps, power packs and flow dividers, products specified by leading OEMs for lift trucks, agricultural equipment, transmissions, mining, construction and road-building machinery. They are used in cooling fans, axle cooling systems, rotary drives, electro-hydraulic lifts, transmission clutch actuation, lubrication, auxiliary brake and steering systems. A highlight of the range is the new FERRA pump and motor series, designed for high-pressure applications and offering increased power density and high durability within a compact space envelope that is 20%-30% smaller than competitive products. 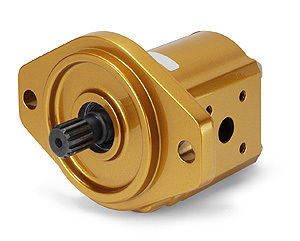 FERRA features an advanced gear profile optimized for reduced pulsation and high power density in relation to the unit's small package size, making it highly suitable for the most demanding duties in construction and agricultural equipment, material handling and other mobile/off-highway applications. IFPE will also provide an opportunity to see the full range of innovative energy-saving and fuel-reducing technologies from the Concentric AB group. These include fixed and variable flow oil, coolant and fuel pumps for diesel engines and transmissions, as well as advanced clutch systems from the German Licos company which has recently been acquired by the group. Concentric AB is a global company serving the worldwide automotive industry from manufacturing plants in the UK, USA, Sweden, Germany, India and China. The FERRA pump and motor series offers increased power density and high durability within a compact space envelope.